Jeanmar Alejandro Gomez… married to Luisa…has one son: Matthew Alejandro…is a 2004 graduate of Unidad Educativa Privada Colegio Arauca, where he played baseball, soccer and basketball…is an avid fisherman…signed by Henry Centeno. Contract was purchased by Chicago-AL on 7/11 and he spent duration of season in White Sox bullpen, posting 4.68 ERA and 1.560 WHIP in 26 relief appearances…his 9.7 SO/9 was a career high for any ML season, but had his lowest GB pct. (38.7%)…finished 5 games, went 0-for-1 in save tries, had 6 holds, and allowed 14 of 28 inherited runners to score…ranked 3rd on CWS staff in appearances from 7/11- end of season…last 13 G beg. 8/18: 3.45 ERA (6 ER/15.2 IP) w/ 22 SO (12.64 SO/9)…had 2 appearances longer than 5 outs: 3.0 IP in season finale on 9/29 at MIN, and 2.0 IP on 8/21 vs. MIN…his 5 K's on 9/4 vs. DET were a career high in a relief outing…spent balance of season at Charlotte (AAA), going 5-0, 2.03 (9 ER/40.0 IP) w/ 1.200 WHIP and 7.9 SO/9 in 30 relief outings…International League opponents slashed .240/.302/.315/.617, including a .186 (11-59) BA by LH batters. Pitched in the Philadelphia, Milwaukee and Seattle organizations … made the Phillies Opening Day roster ... Was on the Phillies disabled list from 5/6-25 with a right elbow impingement … made eight appearances after returning before being designated for assignment on 6/20 and released on 6/25 ... Signed with Milwaukee as a free agent on 7/9 and was assigned to Class AAA Colorado Springs ... Was on the Colorado Springs disabled list from 7/10-18 with a strained groin … made one appearance with the Arizona Rookie League Brewers during a rehab assignment ... Was released by the Brewers on 8/7 and signed by Seattle as a free agent on 8/11 … made five appearances with Class AAA Tacoma before being released on 8/26 ... Went 1-0 with a 1.80 ERA (3 ER/15.0 IP) over 13 games (one start) with Colorado Springs, AZL Brewers and Tacoma. 2013 SEASON: Established career highs in appearances and strikeouts in his first season in the National League with the Pirates...Was a member of Pittsburgh's Opening Day roster...Made first appearance on 4/5 at Los Angeles (NL) and tossed 3.0 scoreless innings...Picked up first win in his second appearance on 4/8 at Arizona...Pitched career-high 4.1 innings of relief (3r) on 4/26 at St. Louis...Made first start on 5/1 at Milwaukee; gave up three runs (two earned) in 4.0ip and received a no-decision in Pittsburgh's 6-4 win...Made spot start in place of the injured James McDonald on 5/7 vs. Seattle and tossed 5.0 scoreless innings in a 4-1 victory... Left his start on 5/12 at New York (5.0ip/2h/1er) due to tightness in his right calf; he sustained a contusion to the calf in the first inning and it tightened to the point where he was removed from the game after the fifth inning...Tied career high with 7.0ip on 5/28 at Detroit...Gave up four runs in the first inning on 6/2 vs. Cincinnati and left the game due to tightness in his right forearm; was placed on the 15-day disabled list the following day with right forearm inflammation/strain...Began a rehab assignment with Triple-A Indianapolis on 6/13 (3.0ip/3h/2r/1er/3bb/3so - 64 pitches)...Made second rehab start with Indy on 6/19 and threw 5.0 hitless innings in an 8-1 win at Norfolk (52 pitches)...Was recalled from rehab and reinstated on 6/26 prior to making final start that afternoon in Seattle (5.0ip/3h/1r/0er/2bb/5so - 81 pitches)...Made last 21 appearances in relief and posted a 4.26 ERA (31.2ip/17r/15er)...Went 2-0 with a 3.77 ERA (45.1ip/19er) in 26 relief appearances overall, pitching at least 2.0 innings 13 times...Went 1-0 with a 2.80 ERA (35.1ip/11er) in his eight starts...Posted a 2.00 ERA (45.0ip/10er) in 15 games on the road; a 1.00 ERA (27.0ip/3er) in his last 11...Went 1-for-13 at the plate; singled off Mat Latos in his first plate appearance on 4/14 at PNC Park before going hitless in his last 12 at bats. 2013 POSTSEASON: Pitched 4.0 innings of relief in Game One of the N.L.D.S. at St. Louis on 10/3 (3h/2r/0er/2bb/0so)...He also struck out against Adam Wainwright in his one plate appearance. Was a member of Cleveland's Opening Day roster for the first time in his career...Split season between Cleveland and Columbus (Indians' AAA)...Made 17 of his 20 appearances with Cleveland as a member of the starting rotation...Went 5-8 with a 6.23 ERA (86.2ip/60er) in 17 starts and 0-0 in 4.0 scoreless innings while making three relief appearances...Went 1-1 with a 2.35 ERA (15.1ip/4er) in four games (three starts) in April...Made first outing in relief with 2.0 perfect innings vs. Chicago (AL) on 4/11 after he was skipped in the rotation due to an early rainout...Was ejected from first start on 4/14 at Kansas City after 2.0 innings, the shortest start of his career and first career ejection; was later suspended five games by Major League Baseball...Earned first win (5.1ip/1r) on 4/21 at Oakland...Lost three straight starts from 6/12-23 and was optioned to Columbus on 6/24...Allowed one unearned run on 10 hits in 7.0 innings while winning first start for the Clippers on 6/29 vs. Norfolk...Scattered two hits while tossing a shutout (9.0ip) on 7/13 at Indianapolis...Tossed 15.0 consecutive scoreless innings from 8/3-8...Won four straight starts from 7/23 to 8/8...Was recalled by Cleveland on 8/29 for the remainder of the season after Roberto Hernandez suffered a right ankle sprain...Tossed 1.0 scoreless inning of relief in first appearance back with the Indians on 8/29 before moving back into the starting rotation for three of his last four appearances...Earned final win (5.2ip/3er) on 9/1 vs. Texas...Went 0-1 with a 5.65 ERA (14.1ip/9er) in five starts with Tiburones de La Guaira during the Venezuelan Winter League. Split the season between AAA Columbus and Cleveland, winning 5 straight starts in Cleveland from August 30-Sept. 22 that equaled a season-high by an Indians pitcher in 2011...Started the season in AAA Columbus and was promoted to Cleveland on April 19 to make 2011 debut at KC (L#1, 4.1IP, 9H, 5R/ER)...Appeared in relief of injured Carlos Carrasco on April 24 at MIN (ND, 3.0IP, 3H, 1R/ER) in his only relief appearance of the year...Made two more starts before returning to Columbus on May 8 after going 0-1 w/a 4.91 ERA in 4 games/3GS (18.1IP, 28H, 10ER)...Allowed just 1 run over 4 straight starts from May 28-June 12, going 2-0 w/a 1.29 ERA (28.0IP, 18H, 4R/ER, 11BB, 22K)... Was 4-1 w/a 2.18 ERA (41.1IP, 35H, 10R/ER) in 6 June starts... Named to the International League All-Star team but did not participate... 4.0IP (5H,1R/ER, 3K) in July 13 for Mahoning Valley during Triple A All-Star Break...Recalled for second time on July 17th to make a spot start at Baltimore (L, 5.1IP, 6H, 5R/ER, 0BB, 2K, 3HR)... Was optioned back to Columbus next day (July 18) and was with Columbus until August 30th...Recalled for 3rd time on August 30th and proceeded to win 5 straight starts from August 30-September 22, going 5-0 w/a 1.80 ERA (30.0IP, 29H, 6ER) over the span before dropping final start of the season on September 27 at Detroit (4.2IP, 10H, 8R/ER)... The 5-game winning streak equaled a season-high by an Indians pitcher (Masterson in April)...Was T2nd in MLB/T1st in the AL in wins (5) after August 29th...In 21 starts at AAA Columbus he was 10-7 w/a 2.55 ERA (137.2IP, 123H, 54R/39ER, 49BB, 107K)... At time of Aug. 30 recall was 2nd in the IL in ERA (2.55), T5th in wins (10), 10th in WHIP (1.25), T15th in innings pitched (137.2) & 15th in strikeouts (107)... Was T3rd among Indians minor league pitchers in wins (10) and 3rd in ERA (2.54). Combined on the year he was 12-6 w/a 3.30 ERA in 26 starts for A Kinston and AA Akron (147.1IP, 134H, 54ER, 45BB, 124K)...Made final 22 starts of the year at AA Akron after his April 27 promotion from Kinston and was named Eastern League Pitcher of the Year after going 10-4 w/a 3.43 ERA in 22 starts (123.1IP, 117H, 47ER, 109K)...He finished 3rd in the EL in ERA, T5th in K, T6th in wins and 3rd in WHIP (1.27)...Among organizational pitchers he was 9th in ERA, 5th in strikeouts and 2nd in wins...Was named to the Eastern League mid-season and post-season all-star teams...Season highlight came in his 4th Double A start on May 21 at Trenton, tossing a 9.0 inning, perfect game (87P, 9.0IP, 0H, 8K)...It was the first perfect game and individual no-hitter in Aeros franchise history and the first perfect game in MiLB since July 15, 2007 (Guillermo Moscoso, Oneonta)...Was the 7th nine-inning perfect game in the Eastern League's 87-year history...Won his first four starts for Akron, allowing just one run in 29.0 innings for an ERA of 0.31 (1BB, 26K, 9H, 93AB, .097AVG)...Tossed 27.0 consecutive scoreless IP at one point and over his last 6 starts between Akron (first 4) and Kinston (last 2), he was 6-0 w/a 0.21 ERA (42.0IP, 15H, 1ER, 4BB, 37K)...Followed that up by going 2-0 w/a 2.83 ERA in 5 June starts (28.2IP, 28H, 9ER) and was 2-1 w/a 3.00ERA in 5 August starts (24.0IP, 26H, 8ER)...Combined on the year minor league hitters batted .242 (134-553, 13HR) off him as right-handed hitters hit just .205 (53-258, 2HR) off him... Was 1-0 w/a 2.45 ERA in 2 Eastern League playoff starts (11.0IP, 12H, 3ER)...Added to 40-man roster on November 20. Spent the year at A Kinston where he was 4th in Carolina League in starts (27)...Over his last 9 starts his ERA was 2.03 (48.2IP, 45H, 11ER). Ranked 5th in the South Atlantic League in starts (27) and 3rd in CG (1)...Finished T4th in the Indians farm system in wins (11) and innings (140.2IP). Ranked 3rd in the GCL in innings (54.1) and 9th in ERA (2.48). March 28, 2019 Texas Rangers selected the contract of RHP Jeanmar Gomez from Nashville Sounds. 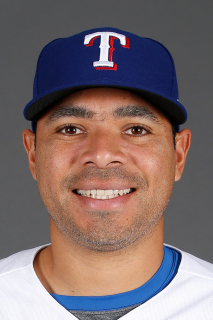 January 9, 2019 Texas Rangers signed free agent RHP Jeanmar Gomez to a minor league contract and invited him to spring training. January 9, 2019 RHP Jeanmar Gomez assigned to Nashville Sounds. October 29, 2018 RHP Jeanmar Gomez elected free agency. July 11, 2018 Chicago White Sox selected the contract of RHP Jeanmar Gomez from Charlotte Knights. February 8, 2018 Chicago White Sox signed free agent RHP Jeanmar Gomez to a minor league contract and invited him to spring training. February 8, 2018 RHP Jeanmar Gomez assigned to Charlotte Knights. August 26, 2017 Tacoma Rainiers released RHP Jeanmar Gomez. August 12, 2017 Seattle Mariners signed free agent RHP Jeanmar Gomez. August 12, 2017 RHP Jeanmar Gomez assigned to Tacoma Rainiers from Seattle Mariners. August 7, 2017 RHP Jeanmar Gomez elected free agency. July 18, 2017 RHP Jeanmar Gomez assigned to Colorado Springs Sky Sox from AZL Brewers. July 16, 2017 RHP Jeanmar Gomez assigned to AZL Brewers. July 15, 2017 Milwaukee Brewers signed RHP Jeanmar Gomez. June 23, 2017 Philadelphia Phillies released RHP Jeanmar Gomez. June 20, 2017 Philadelphia Phillies designated RHP Jeanmar Gomez for assignment. May 25, 2017 Philadelphia Phillies activated RHP Jeanmar Gomez from the 10-day disabled list. May 9, 2017 Philadelphia Phillies placed RHP Jeanmar Gomez on the 10-day disabled list retroactive to May 6, 2017. Right elbow impingement. August 5, 2016 Philadelphia Phillies activated RHP Jeanmar Gomez from the paternity list. August 3, 2016 Philadelphia Phillies placed RHP Jeanmar Gomez on the paternity list. September 20, 2015 RHP Jeanmar Gomez assigned to Tiburones de La Guaira. April 4, 2015 Philadelphia Phillies selected the contract of RHP Jeanmar Gomez from Lehigh Valley IronPigs. January 10, 2015 Jeanmar Gomez assigned to Lehigh Valley IronPigs. January 8, 2015 Philadelphia Phillies signed free agent RHP Jeanmar Gomez to a minor league contract and invited him to spring training. November 3, 2014 Pittsburgh Pirates sent RHP Jeanmar Gomez outright to Indianapolis Indians. October 25, 2014 Pittsburgh Pirates designated RHP Jeanmar Gomez for assignment. October 9, 2014 RHP Jeanmar Gomez assigned to Tiburones de La Guaira. October 2, 2014 Pittsburgh Pirates activated RHP Jeanmar Gomez. October 1, 2014 Pittsburgh Pirates reassigned RHP Jeanmar Gomez to the minor leagues. June 26, 2013 Pittsburgh Pirates activated RHP Jeanmar Gomez from the 15-day disabled list. June 13, 2013 Pittsburgh Pirates sent RHP Jeanmar Gomez on a rehab assignment to Indianapolis Indians. January 9, 2013 Cleveland Indians traded RHP Jeanmar Gomez to Pittsburgh Pirates for LF Quincy Latimore. January 2, 2013 Cleveland Indians designated Jeanmar Gomez for assignment. August 29, 2012 Cleveland Indians recalled RHP Jeanmar Gomez from Columbus Clippers. June 25, 2012 Cleveland Indians optioned Jeanmar Gomez to Columbus Clippers. August 30, 2011 Cleveland Indians recalled Jeanmar Gomez from Columbus Clippers. July 18, 2011 Cleveland Indians optioned Jeanmar Gomez to Columbus Clippers. July 17, 2011 Cleveland Indians recalled Jeanmar Gomez from Mahoning Valley Scrappers. July 13, 2011 Jeanmar Gomez assigned to Mahoning Valley Scrappers from Columbus Clippers. May 9, 2011 Cleveland Indians optioned Jeanmar Gomez to Columbus Clippers. April 19, 2011 Cleveland Indians recalled Jeanmar Gomez from Columbus Clippers. March 25, 2011 Cleveland Indians optioned Jeanmar Gomez to Columbus Clippers. October 8, 2010 RHP Jeanmar Gomez assigned to Tiburones de La Guaira. August 1, 2010 Cleveland Indians recalled Jeanmar Gomez from Columbus Clippers. July 19, 2010 Cleveland Indians optioned Jeanmar Gomez to Columbus Clippers. July 18, 2010 Cleveland Indians recalled Jeanmar Gomez from Columbus Clippers. March 19, 2010 Cleveland Indians optioned Jeanmar Gomez to Columbus Clippers. March 19, 2010 Cleveland Indians reassigned RHP Jeanmar Gomez to the minor leagues. November 20, 2009 Cleveland Indians selected the contract of RHP Jeanmar Gomez from Akron Aeros. August 2, 2009 Jeanmar Gomez assigned to Akron Aeros from Mahoning Valley Scrappers. July 29, 2009 Jeanmar Gomez assigned to Mahoning Valley Scrappers from Akron Aeros. July 4, 2009 Jeanmar Gomez assigned to Akron Aeros from Mahoning Valley Scrappers. June 30, 2009 Jeanmar Gomez assigned to Mahoning Valley Scrappers from Akron Aeros. April 29, 2009 Jeanmar Gomez assigned to Akron Aeros from Kinston Indians.